It has been over five years since our largest change to the Pro Tour Players Club—back when the system switched to the three-tiered structure we have today. Today, we are announcing another major shift in how the Pro Club works, effective after the conclusion of the 2017–18 season that runs from July 31, 2017 until September 16, 2018. The new Pro Tour Players Club will no longer be stationary to a season, but will instead shift to a rolling system that spans seasonal cycles tied to four major set releases each year. Here are the quick hits of what we discuss today. There's a lot to cover, all headlined in the summary below. After the 2017–18 season, the program will transform from a stationary, annual model to a rolling model with four cycles. Players earn Pro Points during these four seasonal cycles, and Pro Club status is determined at the end of each cycle. The Top 3 highest earning Pro Point finishes among events in each cycle will count towards a person's status in the Pro Club. Pro Club benefits will be adjusted for this new model accordingly, and Pro Point thresholds under this new model will be announced before the 2017 World Championship. We're adding a new level—Bronze—effective for the 2017–18 season. Bronze is achieved at 10 Pro Points, and grants players an invitation to Regional Pro Tour Qualifiers and one bye at GP main events. Everyone who had between 10 and 19 Pro Points in 2016–17 will automatically be granted Bronze for the next season. The Pro Club thresholds are not changing for 2017–18 and will remain at 20 for Silver, 35 for Gold, and 52 for Platinum. Here are the basics you'll need to know about the new Pro Club. The new Pro Club will look back at Pro Points earned during the last four cycles to determine a player's status. 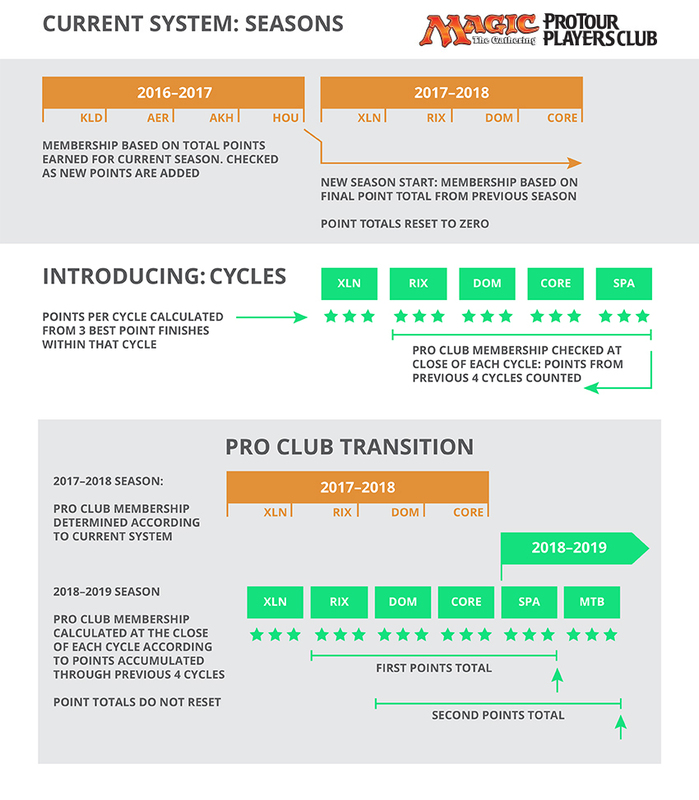 Levels in the Pro Club will be determined at the end of each cycle, rather than as soon as a player meets or passes a threshold for a Pro Club level. Each cycle will be primarily take place within a time in which a set is the latest release for our Constructed and Limited formats, and will be named after each major Magic release accordingly. At the end of each cycle, we'll look back at the last four cycles to see how many Pro Points each player has earned during them. Pro Club statuses will be granted to players who meet the appropriate thresholds, and players in the Pro Club will be granted benefits for the duration of the next cycle. A player's Pro Club level can change as each cycle passes, meaning a player can accrue benefits from Silver for one cycle, then Gold for another cycle, then Platinum for a cycle, then Gold for another cycle, and so on. If you miss for one cycle, you can earn enough Pro points to get those benefits for the next cycle, rather than missing in one season and having for wait for almost another year to potentially get those benefits again. Pro Points can be quickly tracked either via your Planeswalker Points page, or via a leaderboard page similar to what we use for tracking the seasonal races that we'll be creating and regularly updating for players interested at conveniently looking up their Pro Points earned for each relevant cycle. We'll begin maintaining that leaderboard page once the first cycle in this new system completes. No matter what, we'll look at the three events in which you were awarded the most Pro Points in each cycle, and that will be what you get. By shifting to this structure, we are effectively doing away with the Grand Prix cap for Pro Points and are instead instituting an "event cap" to determine your levels. A poor Pro Tour performance can be mitigated with a couple of good Grand Prix finishes in a cycle; a solid Pro Tour finish or World Championship finish gives you a little breathing room. The 2017–18 season will operate in most ways like the system players are participating in today. Players earn Pro Points at events, GPs have a six-event cap, and when players reach a level during the season, they automatically start accruing benefits. Once we've gone beyond September 16, 2018, we will formally transition into the rotating Pro Club. The 2017–18 season will be divided into four distinct cycles. Editor's Note: The Magic: The Gathering Premier Event Invitation Policy published a date of September 16, 2018 for determining 2018 World Magic Cup captaincy, 2017-18 Player of the Year, and 2017-18 Rookie of the Year, and that date has been communicated to players confirming when the cutoff for those races are. The 2017-18 season will be honoring the September 16, 2018 date for determining the captains of the 2018 World Magic Cup and the 2017-18 Player of the Year and Rookie of the Year races rather . For full information, please refer to the Premier Event Invitation Policy. Note that the date for determining the 2018 World Championship will remain for August 5, 2018, as per what is reflected in the Invitation Policy. For the purposes of the 2018 World Championship, the 2018 World Magic Cup, and 2017-18 Player of the Year and Rookie of the Year titles, the cutoff for invitations will remain August 5, 2018, immediately following the fourth Pro Tour of the 2017-18 season. This new Pro Club will shorten the window in which players will accrue benefits from their 2017–18 performance compared to the old model, as rather than accruing benefits for twelve months, it's instead down to thirteen-week chunks. However, it also means a little more wiggle room for players to reach the top levels in the Pro Club every few months. This transitional plan—and the new system overall—will also result in more players who accrue Silver or Gold benefits over the course of the year following the implementation of the new rolling system. Benefits for the new Pro Club after the 2017–18 season will go through a small shift to work with this new structure, and are outlined below. We're also introducing Bronze, a new Pro Club level, to the system, that rewards dedicated players with another path to Regional Pro Tour Qualifiers. For players that win a Pro Tour, Magic Online Championship, World Championship, Rookie of the Year title, or any title that grants a Pro Club status, that player will automatically be granted that status for the current cycle, and then the next four cycles after that. The Grand Prix appearance fees benefit has been adjusted to award appearance fees at the first two Grand Prix a player competes in during each cycle, with a small reduction in the amount from what is in effect for the 2017–18 season. Bronze Introduced . . . and in Effect Starting Today! Bronze offers aspiring Pro Tour competitors a more achievable milestone that gives them access to another chance to qualify via Regional Pro Tour Qualifiers. It's a stepping stone that potentially helps players get to the Pro Tour, which can then lend some support toward a player reaching Silver. More importantly, we're implementing Bronze . . . now! Bronze will be a new level that players can obtain for the 2017–18 season, and any player who receives at least 10 Pro Points will earn Bronze for 2017–18. While players can begin earning Pro Points for that season after the conclusion of Pro Tour Hour of Devastation next weekend, we're granting it to all players who have earned between 10 and 19 Pro Points this season. With the next round of Regional Pro Tour Qualifiers awarding invitations via a scaling system that's based on attendance, it means that we'll be seeing a few more faces at Pro Tour Ixalan, so best of luck at those RPTQs in the coming weeks! Why the Changes to the Pro Club? In giving the Pro Club a hard look at what it's doing for the future of competitive Magic, and when we began to explore other ways to maintain the professional Magic lifestyle, it became clear that the system needed an overhaul to stay relevant for decades to come. The shift from a stationary Pro Club to a rolling one is big, and has some large impacts across the board, so the main question we expect is why we're doing it. The short answer is that the legacy of the structured Pro Club as we knew it has ultimately been the symptom of a number of issues that we and players have faced over recent years, and while it does accomplish some good, it comes with some flaws. These flaws can be relieved through band-aid fixes, but they are ultimately not permanently solvable unless we find a better way. Here's a sample of some of those issues that you may have seen over the last couple of seasons. The "value" of a Pro Tour invitation was different depending on which one you qualified for. The Pro Club system serves an important role of ensuring some consistency and stability for Magic players that want to continue their pursuit of playing the game professionally. In order for that goal to be achieved, however, it placed an unhealthy level of focus on the first Pro Tour of a Pro Club season, as Pro Tours were ultimately the best way to accrue Pro Points, and that meant qualifying for Pro Tour #1 of the season was always more important than any other. In an ideal world, and in an ideal system, players should be excited to qualify for the Pro Tour at any given point in the year. The old system did not accomplish this, and the problems of a structured seasonal system did not just impact the importance of Pro Tour #1, but did some unfortunate things at Pro Tour #4 in a season. The last Pro Tour of a season and its importance in the Pro Club. It's no secret that the last Pro Tour of a season had issues with concessions, oftentimes in Rounds 15 and 16. We've tried procedures in the past to limit these, to marginal effect. In reflecting on what we tried at Pro Tour Eldritch Moon to limit these concessions, it became clear that changing the culture was a better direction to go. Quality-of-life changes and fairness changes were really tough to implement in the old system. A few months ago, one of our Platinum pro players suggested an event cap in lieu of a Grand Prix cap on the number of events that counted towards a player's Pro Club status. We liked the idea in theory, but realized it wasn't something we could implement in the annual season structure we had. The reason is that you have to make the cap too small to ensure it doesn't enlarge the program too much, or we would need to adjust the Pro Point thresholds in such a way to solve this. While we know that the Pro Club does a lot of good work for us, in reality it's still a program we need to be able to budget for, and any changes to the system like that would potentially impact what we're able to do elsewhere. If we're a number off, or if what we implement alters the actions of players in ways that were unexpected, we end up with too many people in our system, too many players for the Pro Tour to handle—which leads to an event that's more expensive for us to run given space constraints, and an event that's less desirable for players who compete in it. It's a real cost we have to manage. The idea was a good way to make points awarded at events like the World Championship fairer while also making the system easier for aspiring players to participate in, but was fraught with uncertainty that was extremely difficult to account for. Enter the new system, where we're able to dial back the number we could cap on events that counted toward a Pro Club season to a cap on events that count towards a cycle, and we were able to take the good aspect of that idea and apply it to this one. On the subject of quality of life, the old system made a Magic player's lifestyle more variant than desired. The Pro Club was initially designed to help support a lifestyle for a Magic player who wished to pursue the game in a professional capacity. While it does to some extent succeed at that, providing some baseline rewards for consistently good play, it also leads to big swings in quality of life depending on how the annual season is going. Imagine having a rough first half of the year. Your first two Pro Tours didn't go so well. You didn't do too hot at the three Grand Prix you've competed in thus far. Now, there's a lot more pressure on the last half of your year. After all, the old system was all or nothing in a lot of cases. Points decayed completely at the end of a season, so if you didn't have status, you weren't getting it any time soon, and that kind of shift was one we've seen before. Although pressure to perform will always exist, the new system alleviates some of this problem. The variables in the system have been dialed back, and the swings are a little less brutal. The old system had issues with expanding. All the details I discussed above made any radical changes to the Pro Club system difficult to predict. We operate on a range of what we expect will happen each season, and any substantial shifts in the number of players competing, or the number of events we're running, made expansion of competitive Magic under this system next to impossible. The system had merits, but was far from flexible. This new system lets us take a lot of the good, radical ideas that we've heard or thought about over the years and apply it to a rolling structure. More importantly, the event cap lets us potentially expand the realm of competitive Magic, something our old system wasn't capable of. In the new system, we can tweak a few numbers, iron out the details, and support those changes to make the Pro Club better and more expansive across all high-level professional Magic, including opportunities that lie beyond our current premier play offerings. That's a lot to take in, but we're excited to take this first step in our transition into Magic's competitive future. Check back tomorrow for a look at 2018's Grand Prix details, and if you haven't read it, check out what's in store for Pro Tours and more in 2018 today.